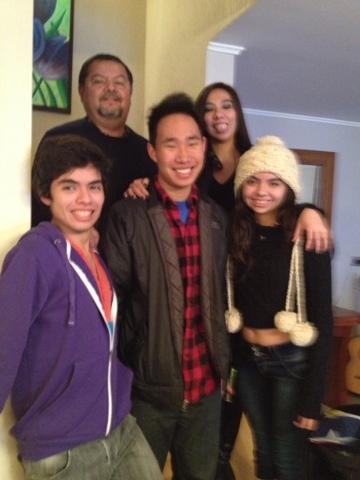 I may have forgotten to mention this, but the family I am with now is actually just my Welcome Family. AFS has this system in place where if they don’t have a host family for you before you leave – you are given a Welcome Family. They are not permanent (usually). Welcome Families do exactly as their name implies – they welcome. My reason for moving is school related. The school in Puente Alto, I was supposed to go to, already has an exchange student and is not taking any extra pupils. As it is one of the few schools in my area, I am forced to be migrate north toward the center of Santiago into either two locations. For now the regions will remain a mystery. However I will give two clues about their nombres (names): De Allende and Rania Al Abdullah. No more hints – the names of my potential new residences are connected with these words. Anyway, I am actually pretty sad about leaving. The Correa Bravos have been really nice to me, their house is awesome, and I love their dog (Aiko). Despite poor weather, no colegio (no high school), and flooded streets, they have made Santiago very, well, welcoming this past week. I am definitely going to keep in contact with them after I leave, and I am really going to miss them. ¡Adios mi familia bienvenida! ¡Hasta pronto! Who knows where I am to be next? Well, I have an idea, but you don’t. More to come about my new, new home, and Santiago’s fantastic interior!